Welcome to the JCCP website! We hope to have the opportunity to meet you and get to know you. Please allow me to introduce myself. My sisters, Sharon and Deborah, and I were born in Tokyo, while my parents, David and Edna Kruse, were studying Japanese and serving as mission workers since 1952. We moved to Yatsushiro City, Kumamoto Prefecture, in 1958, where my parents pioneered the Yatsushiro Bible Church with the Furushima brothers and their families. After Japanese kindergarten, I followed my sisters into home-schooling and then English language boarding schools in Miyazaki Prefecture and Saitama Prefecture. We had visited the United States every five years while growing up, but it was a challenge to live here during college, where I studied History and Education. After teaching high school for several years, I couldn’t wait to return to Japan in 1982. As a mission worker with SEND International, I studied Japanese, worked with Kofu Christ Gospel Church in Yamanashi Prefecture and joined a team of Japanese seminary students, Japanese-American mission workers and other American mission workers beginning a church in Kohoku-ku, Yokohama City. That was so interesting , I came to the United States in 1991 to prepare more fully for church ministry by attending Eastern Baptist Theological Seminary (now Palmer Seminary). I was ordained as a minister in 2009 by the Presbyterian Church (USA), and previously served a church in Fishtown, Philadelphia. My husband, Omar Zambrana, whom I met in seminary, an IT Senior Project Manager with TransUnion, our son, Xavier, a senior at Harriton High School, and I now live in Wynnewood, not far from the church. We try to visit Omar’s family in Bolivia as often as we can. My parents are retired in Sellersville, PA. 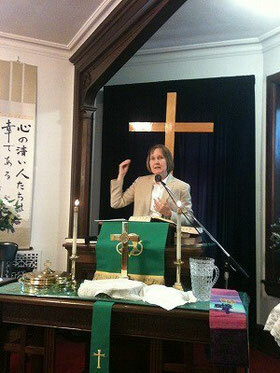 The opportunity to serve this historic Japanese congregation is exciting and challenging. The JCCP community is an amazing group of strong and wise people who have more than one place they count as home. My prayer is that even though you are away from home, you also will find God to be close at hand. In Christ may you experience God’s wonderful love and peace right where you are. (Deuteronomy 30: 11-14) We look forward to your visit!